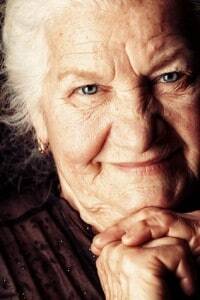 Throughout the United States, nursing home abuse has become an issue of national concern. The National Center on Elderly Abuse shows that only 15 percent of all cases involving physical abuse are reported every year. There were over 5,900,000 actual cases of elderly abuse in 2010, so it is disheartening to consider the numerous cases of physical abuse, neglect or exploitation that went unreported in that year. If you feel that your loved one may be in an abusive situation, you should speak up and not allow his or her case to go unreported. According to information managed by Medicare, there are currently 124 nursing homes rated in West Virginia that are regularly monitored through surveys, investigations and inspections. 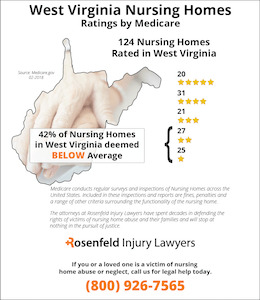 The federal agency found serious violations and deficiencies at fifty-two (42%) of these West Virginia nursing facilities that harmed their residents. Was your loved one injured, abused, mistreated, or did they die unexpectedly from neglect after living in a West Virginia nursing home? If so, we invite you to contact the West Virginia nursing home abuse & neglect attorneys at Nursing Home Law Center today. Let us begin processing your claim for compensation during your free case review to ensure your family receives the monetary recover they deserve. A University of California-San Francisco research study tracked nursing home abuse patterns of West Virginia nursing homes for 2008, and the results are startling. The research study indicated that over 40 percent of nursing homes were unable to maintain a safe environment. Over 54 percent of nursing homes had serious issues with food sanitation, as well as maintaining a high quality of care and developing comprehensive care plans. 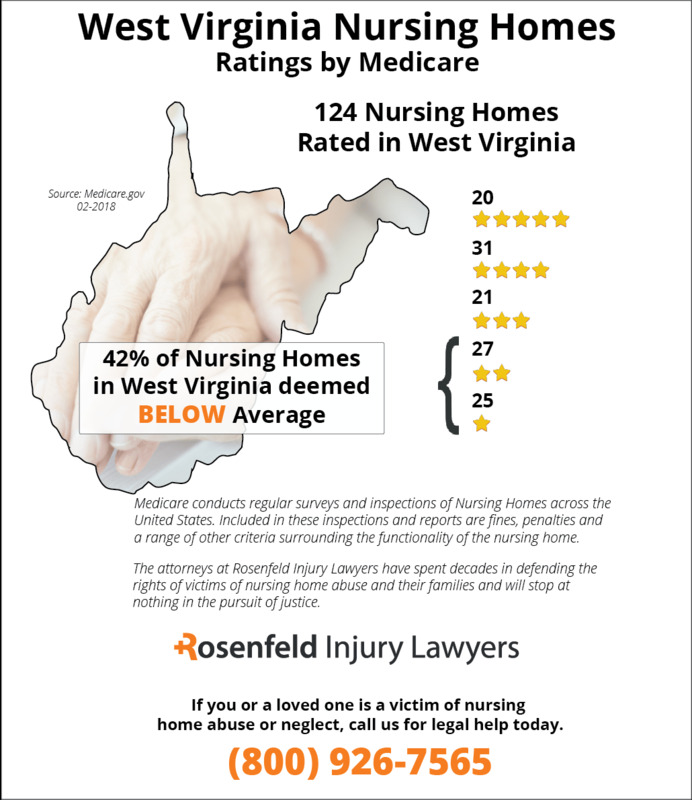 Family members should also be concerned about whether a loved one is developing bedsores, as statistics also show that patients in over 19 percent of West Virginia nursing homes were at risk for developing bedsores. If your loved one has already developed bedsores as a result of inadequate care or attention, then a nursing home lawyer may be able to assist you with your case. 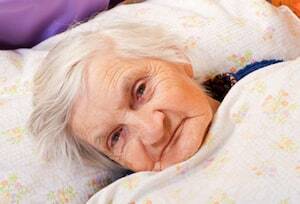 There are strict West Virginia nursing home laws in place to protect elderly people in nursing homes. The Adult Protective Services Act is the governing source of authority for nursing homes in the state. The Nursing Home Reform Act of 1987 is a federal law that also clearly states the many rights that nursing home residents have. Under the Nursing Home Reform Act of 1987, elderly people have the right to receive the medical care that they require, to be treated with respect and dignity, to be free from physical or chemical restraints and to be free from abuse, exploitation or neglect. When family members suspect that a loved one is the victim of abuse, then they may file reports of abuse with the West Virginia Department of Health and Human Services, Adult Protective Services or the Bureau of Senior Services. In West Virginia, there is only a limited period of time in which family members may file a negligence or wrongful death claim on behalf of a loved one. For a negligence claim, family members only have a period of two years to file a claim within discovery of the injury. The noneconomic damages for a medical malpractice claim are limited to $250,000 for each occurrence. There is a cap of $500,000 for all of the injuries that loved ones have suffered. A wrongful death claim may be filed within two years of the date of death of an individual. The noneconomic damages for medical malpractice are limited to $250,000 for each occurrence of negligence that impacted a loved one. There is a cap of $500,000 for injuries that involved serious deformities, the loss of use of a limb or other permanent physical injuries. Talk to our West Virginia elder abuse lawyers to schedule an initial consultation today. Most West Virginia nursing facilities are filled to capacity. This is because the average age of Americans continues to rise as more individuals are living in their retirement years. Because of that, there has been a significant increase in the demand for quality health caregivers. As a result, there are far less properly trained nurses and nurse aides to meet the increasing need. Many nursing facilities throughout the state of West Virginia have been cited by the CMS (Centers for Medicare and Medicaid Services) for negligence, abuse or inattention to patients under their care. Even with the citations, much of the negligence and abuse continues, where patients are victimized in various ways. Without proper monitoring due to unskilled caregivers or minimal staffing, many patients in nursing facilities develop pressure ulcers that are often so severe that the quality of their lives are substantially diminished. The medical team in West Virginia nursing homes are duty bound to provide routine skin monitoring to patients, especially those who have compromised mobility. When the skin is not assessed every day, the patient can easily develop a pressure sore (pressure ulcer; decubitus ulcer; bedsore). Nearly every type of pressure sore can be prevented through a simple readjustment of the body every couple of hours. Turning or repositioning the body alleviates the pressure and minimizes the potential of skin damage or tissue death at the affected site. Because the condition is so easily avoided, most pressure sores acquired in a nursing facility are the result of negligence. When the above basic necessities to high-risk patients are disregarded, and the resident develops a bedsore, the medical staff can be held legally liable for their negligence. West Virginia nursing facilities are obligated to follow medically accepted practices and protocols proven effective at preventing bedsores. In addition, the doctors and nurses are required to develop an effective health plan for every patient upon their admittance to the home. Through implementation of the plan, the patient must be given the best medical care to minimize the potential of developing a sore. If admitted with an existing bedsore, the staff must develop an effective plan to provide quality treatment to start the healing process. When an existing pressure sore is allowed to progress to an advanced stage, the staff and facility can be held responsible for their negligence. As a result, many families hire a West Virginia pressure ulcer lawyer who specializes in medical malpractice lawsuits. The nursing home attorney can take legal steps to stop the negligence, inattention or abuse immediately. Fill in the contact form here to speak with a reputable West Virginia pressure ulcer lawyer listed below. These experienced law firms can accept your case on contingency to help you avoid paying any upfront fees. Your attorney can file a claim demanding financial compensation for the pain, suffering and losses your loved one has endured because of the negligence caused by an irresponsible medical staff.